'Desert Celebration' OGB- (Lin Flanagan, R. 1994). Seedling 90018-1. AB 26"; (66 cm). Midseason bloom. 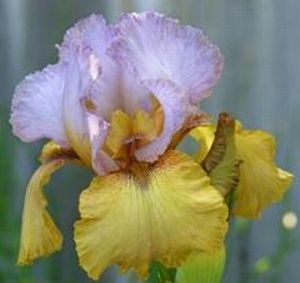 Standards light violet; style arms golden amber; Falls light golden tan, darker streak extending from brown orange beards; ruffled, semi-flared; no fragrance. 'New Moon' X 85035-4: (((('Bethlehem Song' x ('Dove Song' x 'Kalifa Hirfa')) x 'Esther's Son') x ('Shifting Sands' x unknown)) x 'Dune Shadows' x Tb'New Moon')). Aril Society, 1996. Honorable Mention 1998; Award of Merit 2001; Mohr Medal 2004.